In a tough economic climate, more parents need to make hard choices when it comes to finding health insurance for their children. Fortunately, there are some options for no cost health insurance for children. Free health insurance coverage for children is offered through two programs - Medicaid and CHIP - and are funded by the Federal Government but administered by individual states. The application process, guidelines, and eligibility criteria, therefore, may differ slightly in each state. According to Medicaid.gov, Medicaid and CHIP provide medical coverage to more than 60 million Americans. Financial eligibility for Medicaid and CHIP is usually based on the Federal Poverty Level (FPL), which is established each year. The exact amount of the poverty level a family must meet to qualify for Medicaid or CHIP differs in each state, but in general, children of families with an income up to approximately $44,000 per year qualify for CHIP. In states where the FPL guidelines are not used to determine eligibility for Medicaid or CHIP, eligibility might be determined by income or criteria established by other agencies, such as Social Security income requirements. Medicaid provides coverage to entire families, and not solely children. The Medicaid program requires states to provide certain types of coverage, but allows states to elect to provide other coverage. To determine if you are eligible for Medicaid, you can visit your state's Medicaid office, which are usually administered by your state's Department of Health. Starting in 2014, eligibility rules for Medicaid will expand, making more individuals eligible for benefits. State-specific information regarding the changes to the program is available on the Medicaid website. In general, families earning below 133% of the federal poverty level can qualify for Medicaid. Pregnant mothers and infants under one year of age can receive Medicaid with an income below 185% of the FPL. Many children who were previously eligible for CHIP alone can now qualify for Medicaid due to the expansion offered by the Affordable Care Act. The CHIP program began in 1997 and is available throughout all 50 states. The program provides health insurance coverage to kids whose parents earn too much income to qualify for Medicaid, but who still cannot afford to pay for health insurance through a private company. The aim of the program is to ensure that all kids are insured and have access to proper medical care when needed. CHIP programs are usually managed by each state's Departments of Health. Usually, the same division of the department will manage Medicaid and CHIP programs, and some families will qualify for enrollment in both programs. In 1946, many hospitals throughout the country began receiving government aid for renovations. In exchange, these hospitals were required to provide free or low-cost healthcare to individuals within their community who could not otherwise afford to pay. These "safety net" hospitals are still in operation even though the government funding ended in 1997. Altogether, there are about 170 hospitals and other healthcare facilities nationwide that are obligated to offer low-cost or free healthcare. You can check this list to see whether such a facility is operating in your area. Once you identify a facility nearby, you may need to fill out some paperwork to apply for free care. You may be asked to provide proof of income or to apply for Medicaid; these steps must be completed before the free care can be received. Some communities may also have charitable clinics. These facilities are operated as non-profit organizations and may offer free or low-cost healthcare to anyone in a community. The National Association of Free & Charitable Clinics provides information about these programs. If you are unable to afford private health insurance, contact your local health department office to determine if your family or child qualifies for Medicaid or CHIP. Note that 16 states operate under "presumptive eligibility" rules, which allow children to receive benefits under Medicaid or CHIP prior to their parent's application being fully processed. 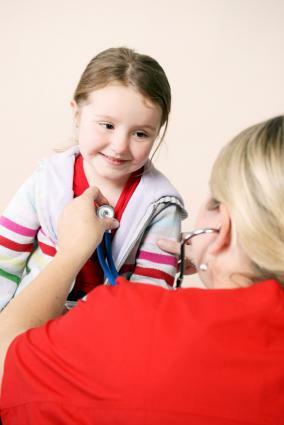 This may allow your child to obtain health insurance quickly at no cost to you. If you live near a free or charitable clinic, you may also be able to receive care for your children without waiting for Medicaid paperwork to be processed.